You can now print from your personal laptop into Moore 100 or into the CETS office (for color printing). See instructions here. The SEAS Survival Guide provides newly admitted students with a resource that highlights both the academic and social aspects of Penn Engineering. This guide aims to consolidate the overwhelming amount of information received during NSO and through the Student Handbook, while suggesting crucial tips to help students enhance their Penn experience. EDAB’s Guide to Finding a Research Position summarizes how best to determine one’s area of interest in research, how to pinpoint research positions and contact professors/labs of interest, the benefits of pursuing research as an undergraduate, and alternatives to Penn Engineering research. The Submatriculation Survival Guide aims to provide students with a consolidated source of information to help them understand the submatriculation process. It briefly explains what submatriculation is and when to apply, lists some of the benefits of submatriculating, summarizes the masters programs, and gives contact information for each program. 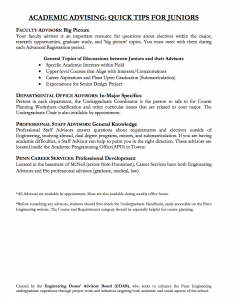 The Study Spaces Pamphlet aims to provide students with a consolidated list of the various kinds of study spaces available around engineering. 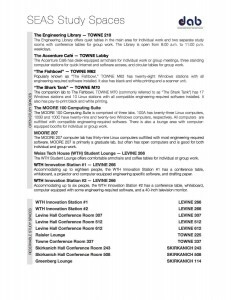 This listing will include open spaces such as Moore 100, The Fishbowl, and Weiss Tech House, places students can reserve such as rooms in Levine and Skirkanich, and information about the type of the different type of study environments available. Also, click here to explore an interactive map of these study spaces. 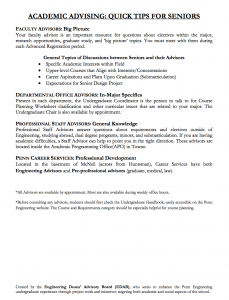 This series of academic advising tips has cheat sheets for knowing what to ask and to whom at any point in your academic career.